Replenishing Duo Pack - $26.95 Our Replenishing Shampoo has been created to gently cleanse, defriz or detangle, and deal with hair that’s unmanageable. This Pawpaw-based Replenishing Shampoo uses natural ingredients to help maintain and manage your hair. A shampoo containing 10% of our concentrated McArthur Pawpaw Extract™ which aids in rehydrating and restoring the hair’s natural shine and beauty. It is suitable for all hair types and everyday use. Our Replenishing Conditioner leaves hair soft, nourished, healthy-looking and easy to style. It’s an ideal product for healthy hair and also for hair that’s dry and brittle, perhaps with split ends, and sometimes coarse, frizzy, flyaway or generally unmanageable. 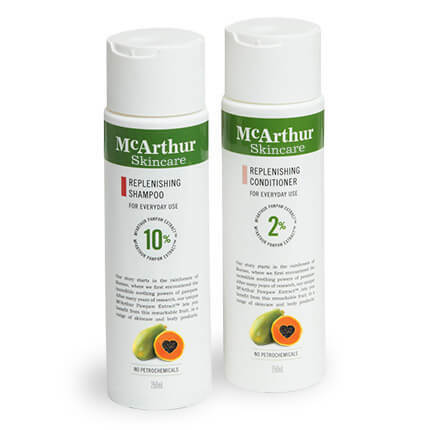 Containing McArthur Pawpaw Extract™ our Replenishing Conditioner is the perfect partner to McArthur Skincare's Replenishing Shampoo providing a luxurious, thick moisturising treatment that’s designed for all hair types. It uses Pawpaw (Papaya, Papaw) to nourish and restore, creating soft, easy to manage hair. The main active natural ingredient of the Replenishing Duo Pack is Pawpaw (Papaya, Papaw) in combination with other natural ingredients including those derived from Coconut, Citrus Fruits and Jojoba Seed Oil. Always keep your McArthur Skincare's Replenishing Shampoo and Replenishing Conditioner stored at a temperature under 30° Celsius. Active natural ingredients have been carefully selected and blended by our McArthur Skincare specialists to create our Replenishing Duo Pack. Apply a small amount of replenishing shampoo to wet hair. Leave on hair for 1-2 minutes before rinsing. 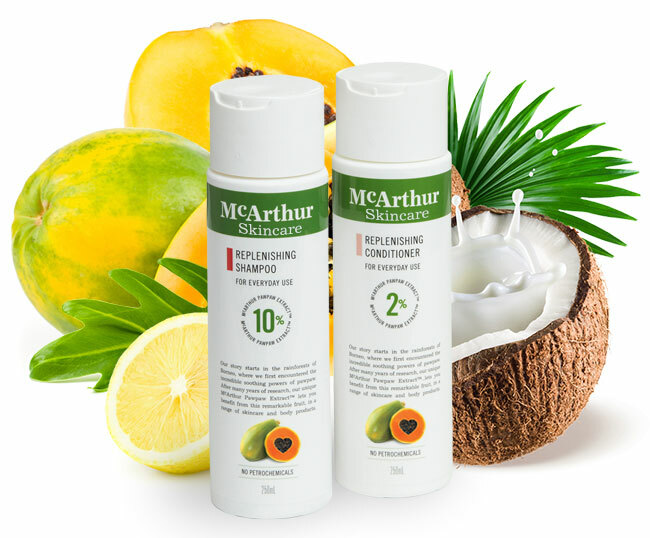 For best results, follow with McArthur Skincare's Replenishing Conditioner.